This past weekend was perfect. There is nothing quite like enjoying a relaxing weekend with a lifelong friend. And I got to do just that! My friendship with Joan goes back to our early college days. Last weekend we enjoyed time together catching up at Joan’s lake house in the Missouri Ozarks, in southern part of the state. It was just the two of us for the weekend. There were no men, children, or other friends to sway our attention. While the lake is a hot spot during the summer, every season in the Ozarks is to be enjoyed for its natural beauty. Spring is pushing forth in the southern Missouri and the Ozarks is alive with it. Amidst the constant conversation shared by two long-time friends who have not seen each other in months, we enjoyed watching goldfinch, pileated woodpeckers and other birds make their way to the bird feeders Joan has near her deck. And the trees seemed to be bursting forth their leaves before our very eyes during Saturday’s 80 degree temperatures. Joan tends a lovely garden she has planted around her deck. Because the property is a weekend home, everything she plants must withstand neglect and is drought tolerant. 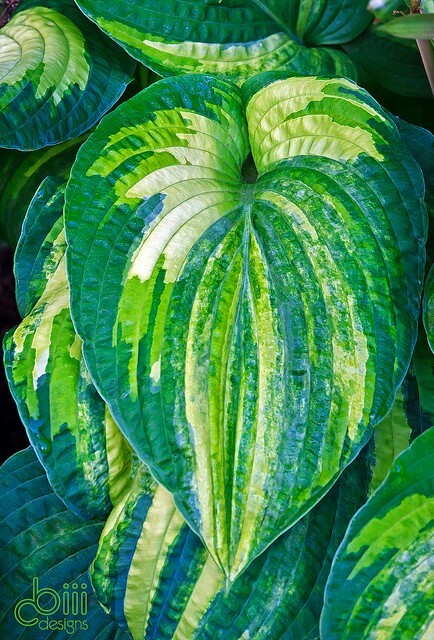 It must also be hardy enough to survive in the the rocky soil the Ozarks is known for. Canna meets those criteria. In my last post I shared that I am obsessed with adding this tall tropical to my yard. I have never grown them but between our catching up, eating and relaxing, Joan gave me a quick lesson in Cannas. 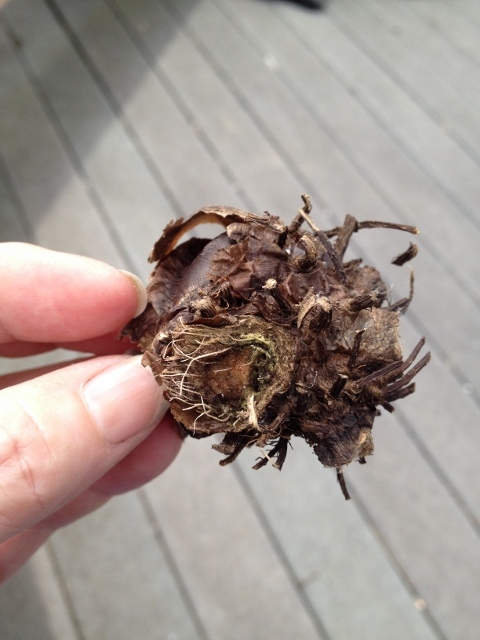 She hauled out her over-wintered bulbs from last year’s garden and we commenced to cleaning them and planting them in very large pots she has on her deck. 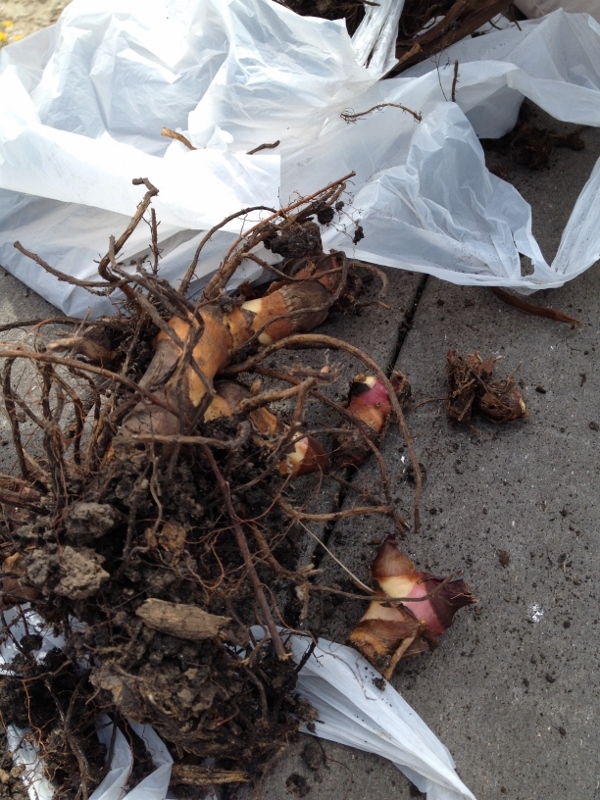 The bulbs were over-wintered in soil in a plastic bag in the basement. Joan inspects the bulbs to see what condition they are in. She is looking for larger bulbs such as those shown here. 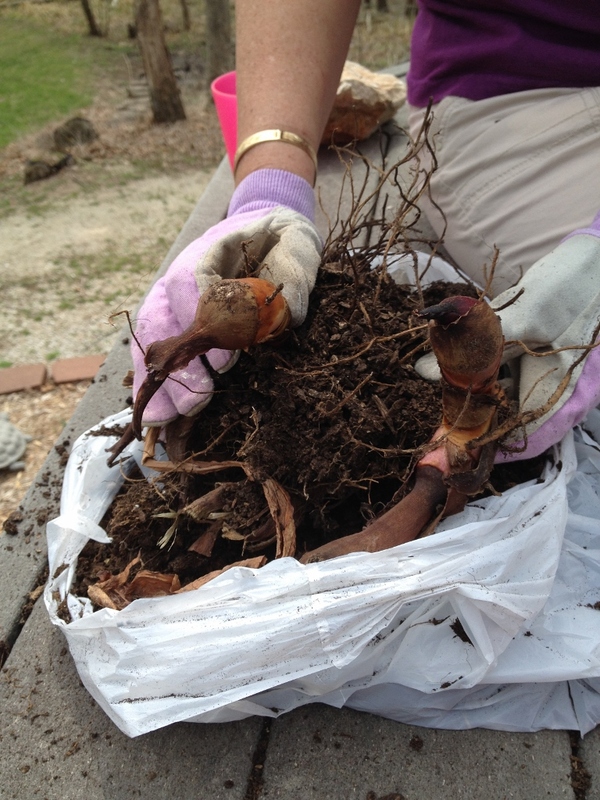 She gently pulls the bulbs from the soil as she prepares to plant them. 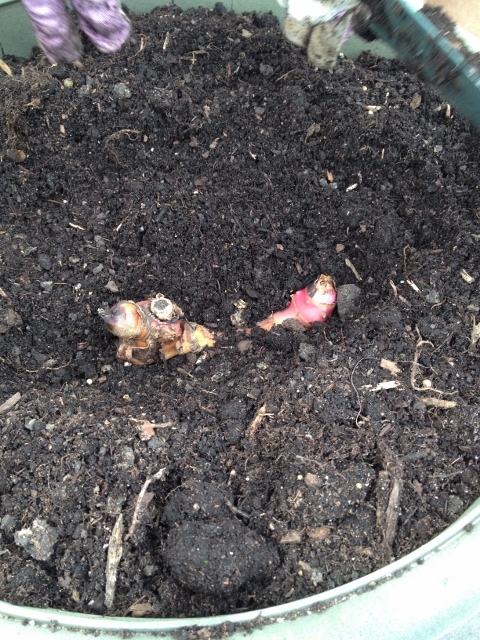 This is what the bulbs look like after much of the soil is removed. 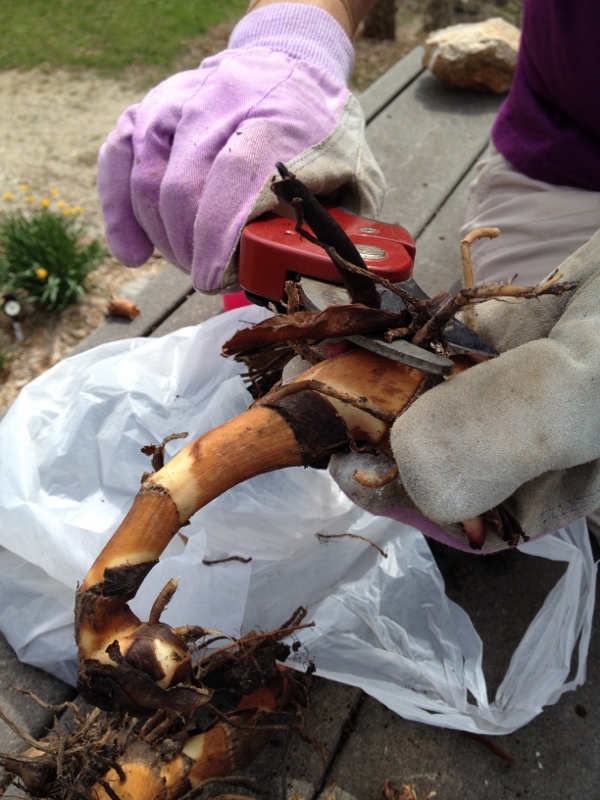 We then began to trim the dead roots off the bulb as well as any spongy, dead plant material so that we are left with a clean bulb for planting. We trimmed off lots of spongy, dead material. The decayed stuff is easily identifiable because it is a dark and soft matter, as opposed to a healthy bulb which is firm and white. 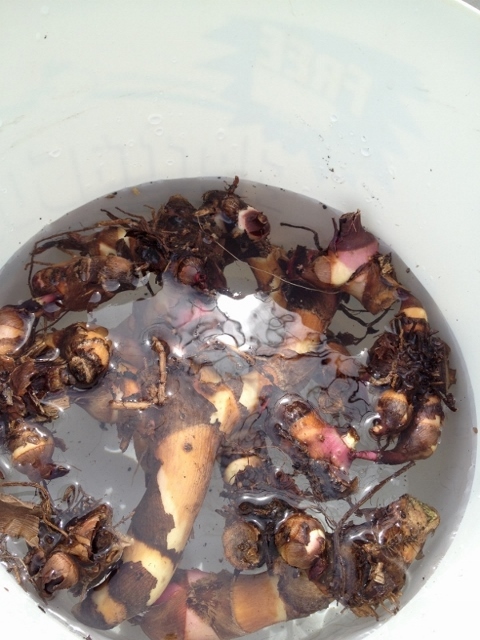 We soaked the bulbs in water to further clean them and re-hydrate them after a long winter in the basement. It’s always fun at the lake and a spring weekend in April is not exception. Thanks Joan! Keep on smiling. Categories: Beyond Arch City, Plants | Permalink.